Mural painting of St. Francis of Assisi. Courtesy of North Texas Catholic. Image available on the Internet and included in accordance with Title 17 U.S.C. Section 107. 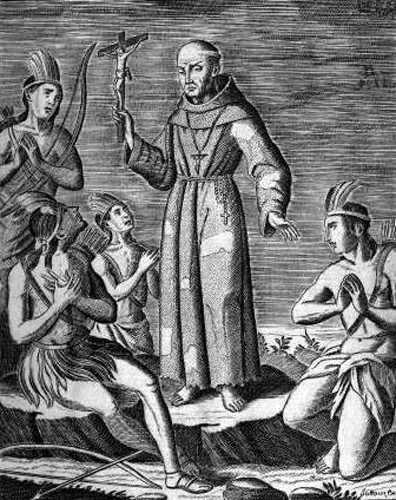 Drawing, Picture of spanish missionaries in their attempt to convert Native Americans in Texas. Courtesy of Legends of America. Image available on the Internet and included in accordance with Title 17 U.S.C. Section 107. Drawing, Portrait of Bishop Jean Marie Odin. Courtesy of the Archdiocese of Galveston-Houston. Image available on the Internet and included in accordance with Title 17 U.S.C. Section 107. CATHOLIC EDUCATION. The Catholic Church, always concerned with the education and training of youth, brought its educational system to Texas in 1682 when Franciscans established the first Texas mission at Corpus Christi de la Isleta (Ysleta) near El Paso. In mission schools the Indians were taught not only religion by a special Indian catechism, but reading and writing in the Spanish language; they were given instruction in vocational training, agriculture, and caring for the sick, along with cultural training in crafts, painting, sculpture, and music. More than 100 years later, with the secularization of the missions beginning in 1794 and finally ending in 1830, this work was abandoned. When Jean Marie Odin arrived in Texas in 1840, he was distressed at what appeared to be a spiritual neglect of the people, and he recommended to his superior a need for Catholic schools in Galveston and San Antonio. He organized a school in Galveston in 1842 with twenty-two pupils, one-third of whom were non-Catholics. After purchasing the Love estate in Galveston in 1845, he invited the Ursuline Sisters from New Orleans to open a school for young ladies. Ursuline Academy, in Galveston, opened on February 8, 1847. Two other schools operating in 1847 were St. Mary's School at Brown's Settlement in Lavaca County and a school for boys at Brazoria. A fourth school was listed in Houston in 1848, taught by the pastor of St. Vincent's Church there, and in 1849 schools in Castroville and Cummings Creek were reported. 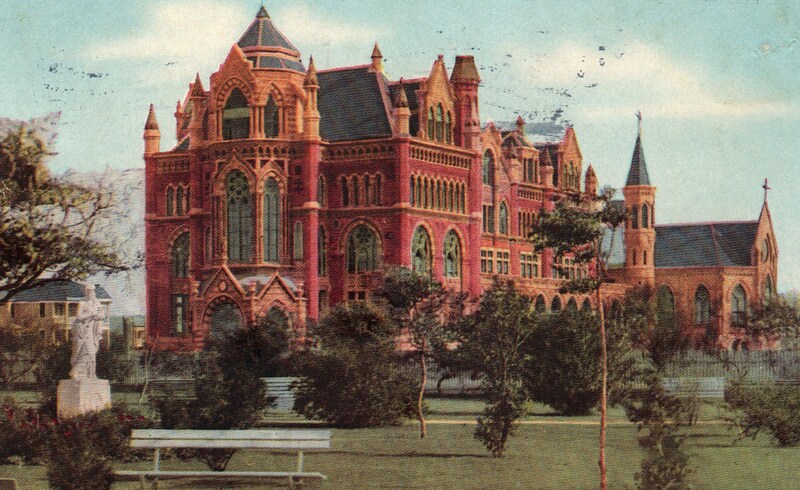 Drawing, Postcard image of Ursuline Academy in Galveston in 1912. Image available on the Internet and included in accordance with Title 17 U.S.C. Section 107. With help from the Ursuline convent in New Orleans the Galveston Ursuline Sisters opened a girls' school in San Antonio in 1851. The Marianists arrived in San Antonio from France in 1851 and opened St. Mary's School for boys in 1852 (see ST. MARY'S UNIVERSITY). Bishop Odin established the Sisters of the Incarnate Word and Blessed Sacrament from Lyons, France, in Brownsville, where they opened Villa Maria Academy for girls in 1853, after arriving in Galveston in June 1852. By 1856 schools for boys were reported in Brownsville and Laredo. 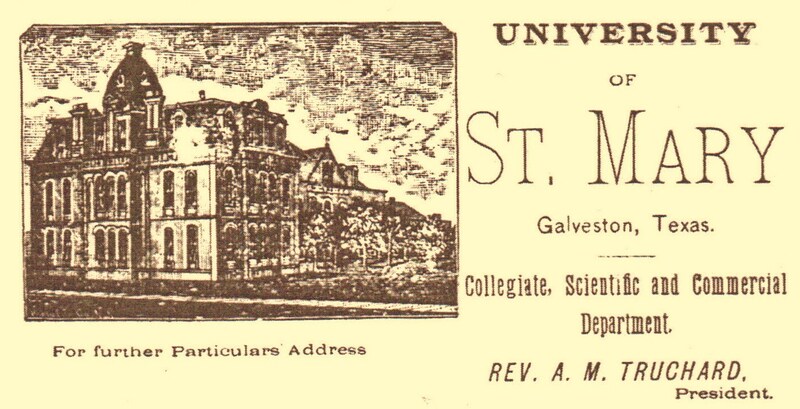 Paper advertising for University of St. Mary in Galveston. Image available on the Internet and included in accordance with Title 17 U.S.C. Section 107. For training a native clergy, Bishop Odin persuaded a young missionary society in France, the Oblates of Mary Immaculate, to come to Texas in 1852. They opened Immaculate Conception College and Seminary in Galveston in November 1854, which was chartered in 1856 as St. Mary's University of Galveston and continued as such until 1924. In 1926 the original charter was amended to read "at La Porte." Drawing, Portrait of Bishop Claude-Marie Dubuis. Courtesy of South Texas Catholic. Image available on the Internet and included in accordance with Title 17 U.S.C. Section 107. A sister of Charity of the Incarnate Word in San Antonio, TX. Image available on the Internet and included in accordance with Title 17 U.S.C. Section 107. In 1866 Bishop Claude-Marie Dubuis brought two groups from France. Two Sisters of Divine Providence arrived in Austin in October 1866 and opened the first Catholic school there in December; in 1868 they opened schools in Corpus Christi and Castroville. In 1895 they established Our Lady of the Lake Academy in San Antonio, a school that was expanded into a four-year college in 1913. The second group, three Soeurs Hôpitalières, who at Bishop Dubuis's request were trained for work in Texas by the Sisters of the Incarnate Word and Blessed Sacrament in Lyons, opened St. Mary's Infirmary, Galveston, in 1866, and Santa Rosa Infirmary, San Antonio, in 1869 (see CATHOLIC HEALTH CARE). These nuns, later known as Sisters of Charity of the Incarnate Word, opened a parochial school in connection with St. Joseph's Orphanage in 1875 and in 1893 established Incarnate Word Academy, to which a college program was added in 1909. 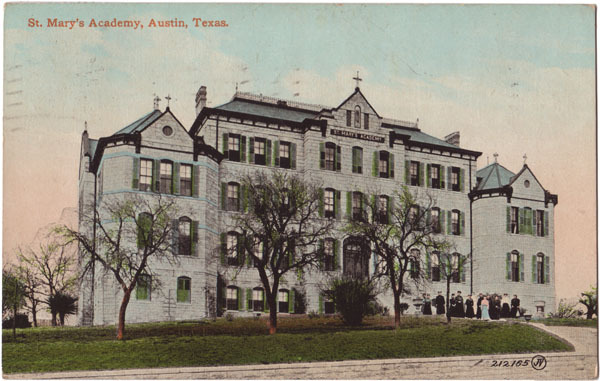 Postcard drawing of St. Mary's Academy in Austin, TX. Image available on the Internet and included in accordance with Title 17 U.S.C. Section 107. 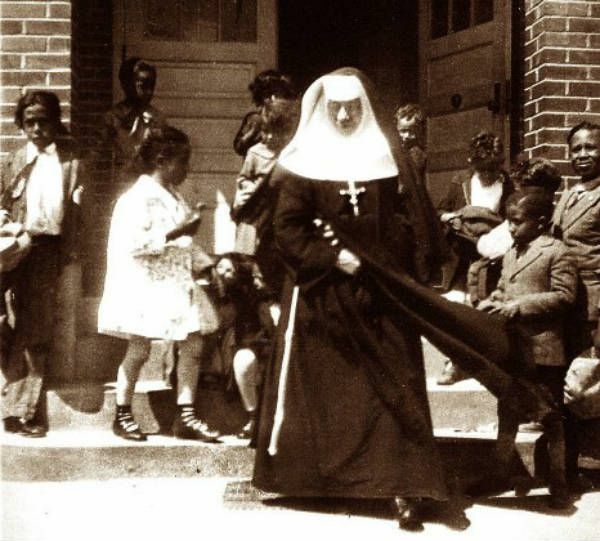 Picture of a nun belonging to the Sisters of the Blessed Sacrament for Indians and Colored People. Image available on the Internet and included in accordance with Title 17 U.S.C. Section 107. After the Civil War the Incarnate Word sisters of Brownsville started academies at Victoria (1866), Corpus Christi (1871), and Houston (1873). The Ursulines formed separate communities and academies at Laredo (1868), Dallas (1874), Puebla, Mexico (1892), and at Bryan after the Galveston hurricane of 1900. The Sisters of St. Mary of Namur moved to Waco in 1873 and established Sacred Heart Academy. In 1885 they established Saint Ignatius Academy in Fort Worth, which became their headquarters and Our Lady of Victory College (now merged with the University of Dallas). The Sisters of Mercy of New Orleans arrived in Indianola in January 1875 and opened a school in September, but within a month that building, along with most of the town, was destroyed by a hurricane; they moved to Refugio, where they opened their first permanent school. A second group of Mercy sisters, from San Francisco, established a school in the German community of Mariensfeld (Mariensfield, later changed to Stanton), which operated from 1894 until 1938, when it was moved to Slaton. In 1874 Holy Cross Fathers and Brothers and Holy Cross Sisters from Indiana arrived in Austin. The priests assumed charge of St. Mary's parish, and the brothers prepared buildings for a Catholic boys' school, which was formally opened in 1881 as St. Edward's School for Boys and chartered as St. Edward's College in 1885. The sisters established St. Mary's Academy in Austin in 1874 and in 1880 opened a parish school in Marshall, also called St. Mary's Academy. Five Sisters of Loretto from New Mexico opened St. Joseph's School in San Elizario in 1879 and moved it to El Paso in 1892, where they also sponsored the new Sacred Heart School. Dominican Sisters of Somerset, Ohio, moved their new foundation to Galveston in 1882 and opened a select day and boarding school for girls, Sacred Heart Academy (later Dominican High School). Holy Rosary School for Negroes, begun by the Dominican sisters in Galveston in 1887, grew so rapidly that a new and larger building was constructed the following year. The order also staffed the following schools: St. Mary's Cathedral, Galveston (1893); St. Mary's, Taylor (1896); and Sacred Heart, Houston (1897). With the opening of schools in Galveston and Houston in 1887, interest in education for African Americans began to increase. In 1893 Margaret Mary Healy-Murphy founded a congregation in San Antonio, the Sister-Servants of the Holy Ghost and Mary Immaculate (later the Sisters of the Holy Spirit and Mary Immaculate). Beginning at St. Peter Claver's parish school, they expanded to Dallas, Fort Worth, Houston, and Beaumont. Sisters of the Holy Family, a community of black nuns founded in 1842 in New Orleans, took charge of Holy Rosary School in Galveston in 1897, reorganizing it into a grammar and industrial training school. Their work was extended to Houston, San Antonio, Ames, and Marshall. A third group dedicated to work among blacks, the Sisters of the Blessed Sacrament for Indians and Colored People, founded in 1891 in Philadelphia, established a school in Beaumont in 1916 and later founded schools in Port Arthur, Houston, and Orange. Parochial schools assumed a major role in Catholic education with immigration in the nineteenth century. Schools for German, Polish, Czech, Mexican, and Anglo children often were established along with new churches. After 1900 parochial schools increased steadily in number and quality, although many of the earlier ones closed or were consolidated with public schools. Photograph, Picture of the front of St. Mary's University in San Antonio, TX. Image available on the Internet and included in accordance with Title 17 U.S.C. Section 107. Photograph, Picture of St. Edward's University in Austin. Image available on the Internet and included in accordance with Title 17 U.S.C. Section 107. Photograph, Picture of Our Lady of the Lake University, located in San Antonio, TX. Image available on the Internet and included in accordance with Title 17 U.S.C. Section 107. Higher education also was a Catholic concern. Although St. Mary's University in Galveston (1854–1924) and the University of Dallas (1907–27) closed, St. Mary's University in San Antonio and St. Edward's University in Austin continued to operate with increased enrollment, as did two Catholic women's colleges in San Antonio, Our Lady of the Lake University (coed 1969) and Incarnate Word College (coed 1971). Subsequently established colleges were Dominican College in Houston (1945; closed 1975); the University of St. Thomas in Houston (1946), established by the Basilian Fathers, who entered Texas in 1899; and the University of Dallas, reestablished in 1956. A trend toward junior colleges developed in the early 1960s with the opening of Our Lady of Perpetual Help College in Houston and Christopher College of Corpus Christi (closed in 1968) by the Sisters of the Incarnate Word and Blessed Sacrament. 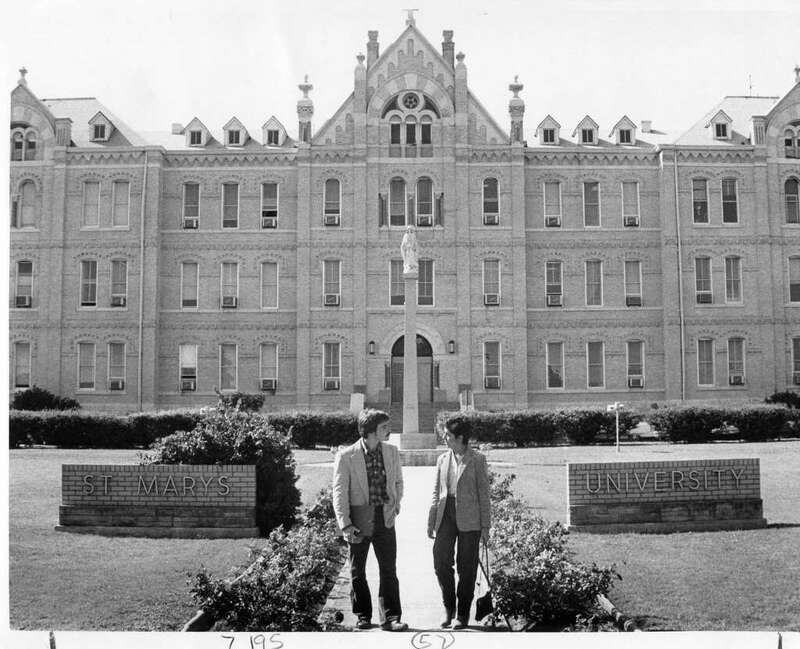 In a move toward coeducational universities, Maryhill College for Women was founded at St. Edwards University (Austin) in 1966, administered by the Sisters of the Immaculate Heart of Mary. By 1971 Maryhill College had become a part of St. Edwards University, the sisters remaining as part of the faculty and staff. Despite the demise of numerous Catholic schools over the years, and partly as a result of controversy over the quality of public schools as well as increasing crime and drug use in them, Catholic education was thriving in the early 1990s. In 1992 statistics on Catholic education in Texas showed 579 sisters, 68 brothers, 148 priests, 2 scholastics (post-novitiate teaching assistants), and 4,673 lay teachers, a total of 5,470 teachers in 16 seminaries, 7 colleges and universities, 23 diocesan and 24 private high schools, 207 parochial and 21 private elementary schools, and 7 protective institutions. Enrollment comprised 301 seminarians, 17,688 collegians, 15,141 high school students, 58,838 elementary pupils, 461 students in protective schools, and 69,725 high school students and 238,967 elementary students in Confraternity of Christian Doctrine classes (parish-run religion classes); this brought the total number receiving Catholic instruction to 400,660. Max Berger, "Education in Texas during the Spanish and Mexican Periods," Southwestern Historical Quarterly 51 (July 1947). Carlos E. Castañeda, Our Catholic Heritage in Texas (7 vols., Austin: Von Boeckmann-Jones, 1936–58; rpt., New York: Arno, 1976). The Official Catholic Directory. Handbook of Texas Online, Sister M. Claude Lane, O.P., "CATHOLIC EDUCATION," accessed April 18, 2019, http://www.tshaonline.org/handbook/online/articles/iwc01. Uploaded on June 12, 2010. Modified on October 14, 2016. Published by the Texas State Historical Association.